Learn how to preserve your chili peppers in olive oil so you can enjoy them longer. They’re like summer in a jar. Preserving your chili peppers is important if you want to keep them longer. It is impossible to keep your chili peppers fresh forever. It is just the nature of chili peppers and any natural food! They will eventually rot and spoil if you don’t preserve them in some way. 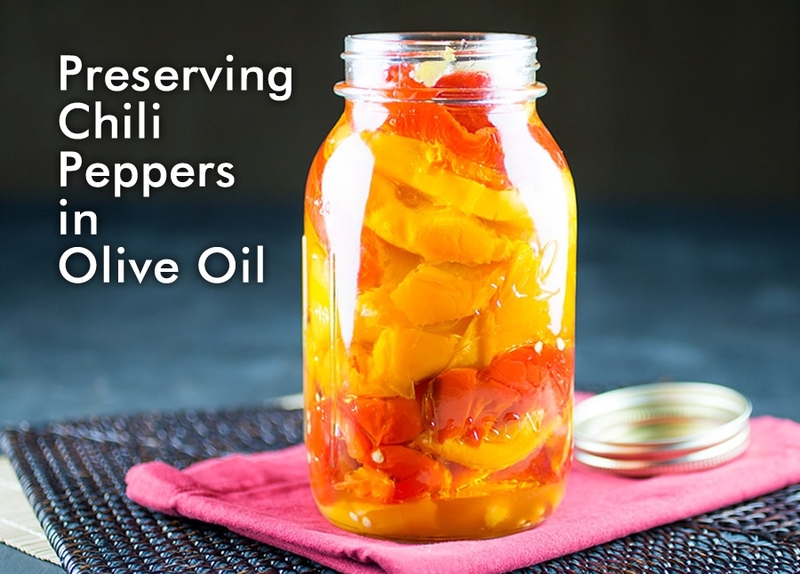 One way is to preserve your peppers in olive oil. The peppers won’t keep as long as other methods, unless you freeze them, though they will last a few weeks at least, giving you plenty of time to enjoy them. If you’re a crazy chili pepper lover like we are, they won’t last that long anyway. You’ll probably gobble them down. It is important to roast the peppers first. There is so much more flavor in a roasted chili pepper. 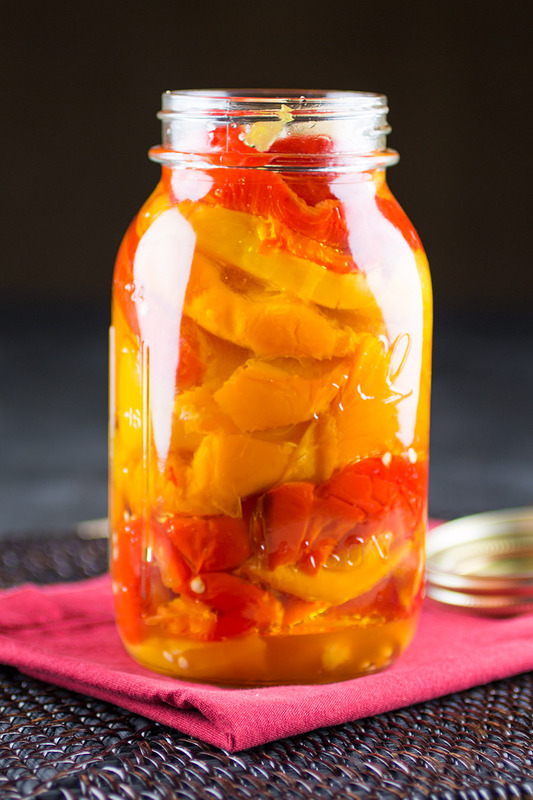 The method below is a basic method for preserving peppers in oil, but you can easily vary it up by adding new flavors and ingredients. Garlic is a favorite, as are certain herbs and seasonings, though garlic won’t last as long as other ingredients. Salt and pepper are standards as well, though consider other chili powders, rosemary, basil, cumin, Cajun or Creole blends. Clean your peppers thoroughly and dry. Slice them in half lengthwise. Roast the peppers in a broiler or on a grill over medium heat until the skins are bubbly and blackened. For other methods, see How to Roast Chili Peppers. Be sure not to overcook. Remove and allow to cool. You can also place them into paper bags and allow them to steam to help loosen the skins. Skin the peppers and remove the seeds and innards, if desired, though bear in mind most of the heat in within the innards. Cut the flesh into thick strips. Add the roasted pepper strips to a cleaned, sterilized jar. Pour in enough olive oil to cover, then cover with a tightened lid. Be sure to make airtight. How Long Will My Peppers Last in Olive Oil? This method of preservation should keep your chili peppers for a week in the refrigerator with this method. It is not meant for long term storage. What If I Want My Peppers to Last Longer? If you want a longer term storage method for preserving your peppers, considering How to Pickle Chili Peppers. I have a lot of information on this technique. If you’d like to keep them for around a year, freeze them instead in proper freezing containers, like thick plastic bags. An alternate method is to include some oil with your pickled pepper recipe. I good ratio is 2 parts 5% vinegar, 1 part lemon juice and 1 part olive oil along with herbs and spices, and your peppers, of course. With proper processing, your peppers will last much longer. Here is recipe you can review: Roasted Peppers in Garlic Olive Oil. Learn how to preserve your chili peppers in olive oil so you can enjoy them longer. They're like summer in a jar. Roast the peppers in a broiler or on a grill over medium heat until the skins are bubbly and blackened, about 15 minutes. For other methods, see How to Roast Chili Peppers. Be sure not to overcook. Remove and allow to cool. You can also place them into paper bags and allow them to steam to help loosen the skins. Will last a couple months or longer. If using garlic or herbs to flavor the oil, it will only last a week. Keep refrigerated. I’d like to jar Thai peppers to last me a year. Normally I just destem the pepper and grind it. I then let them simmer for 20 minutes in canola oil, as olive oil would be a waste, and use. I’m worried about botulism if I put them in jars and use after 6 months or a year. Add citric acid? If so will it alter taste and how much? Hey, Mario. If you are looking for longer term storage, it’s best to use an acid as you’ve mentioned. I would use a 5% vinegar (2 parts) with 1 part lemon juice and 1 part oil, along with herbs and seasonings with the peppers. Let me know if this helps. Can I roast my jalapeno and my sweet chili’s and peel and pack them in jars, top with olive oil and herbs and spices – then seal and process them in water bath to lengthen their shelf life. Would like to hold them for longer than 3 months. Any suggestions other than freezing them. Glynis, peppers preserved in olive oil really don’t last more than a few months unless you freeze them. Refrigeration will extend the preserving time. If you do want to water bath or pressure can them, you should use a brine solution with only a bit of olive oil in the mixture, for longer term storage. Michael, yes, I think this recipe will work. It sounds very much like a homemade giardiniera recipe. How much time can be saved this way? Darko, the peppers will last this way about a week or so refrigerated. If you’d like longer term storage, consider adding a brine solution or pickling, or pressure canning with oil. I have already dried hot peppers. Can I just drop into olive oil. Will they spoil. REPLY: Mikey, you can do so, but the peppers won’t permeate quite as much. — Mike from Chili Pepper Madness.